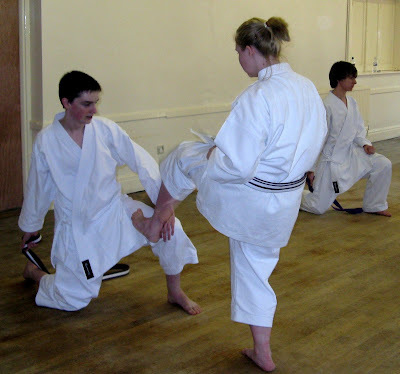 Above : February 2009 Dom has started to step the pace up, training with Sensei Simon from Haxby when Kato Shihan visited our dojo at Selby. I am sure that the rest of us will enjoy looking back at Dom's journey more than Dom, but never mind, eh. 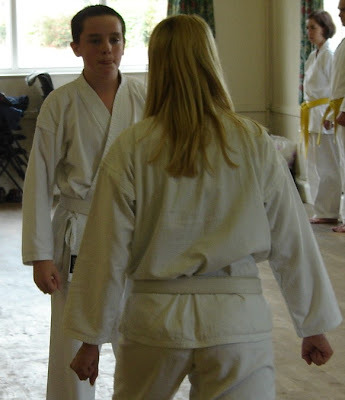 Dom you have five years of strong foundations under the instruction of Sensei Ash & Andy, the hard work is in the bank. A quote from Kato Shihan at a Shodan grading in Budapest a few years ago, after the 20+ karateka who were grading had just undertaken their first Kihon sequence...." Relax, it is easy if you are good enough"
It has been my pleasure to watch you grow from a boy to a man. You apply yourself well to anything you set your mind to be it Music/ Studies or Karate. Otagari ni rei. I have uploaded a few more kata from Latvia, they are "step by step" guides. 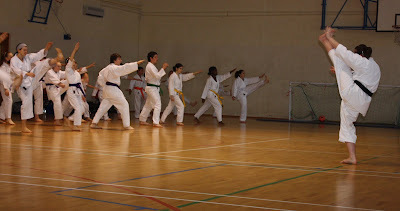 If you follow the link to my kata page and double click on the kata name, it will take you to the individual kata page. If you double click on the video titled "step by step" guide, it will take you back to YouTube, click on "more info" in the sidebar and it will bring up a full list of all the moves. Considering these latest championships were held at a different venue to last year, with a reduced mat and viewing area, the organisation and efficiency was upto the usual high standard. Thanks, once again, must go to Sensei Campbell and Langley and to their team for running this event at a consistently high level. Purely from a 'table' outlook, the Kata and Kumite was also of an overall high standard. The technique, speed, focus and attitude of the majority of competitors in both Kumite and Kata were a pleasure to watch and epitomises the Karate spirit, with only the odd exception of bad sportsmanship directed at fellow competitors or officials. Congratulations to those competitors who entered from the Selby, Haxby and York clubs and who were successful in their various categories. Commiserations to those who entered and didn't reach the top three in their categories. The one common achievment for everyone that did enter was experience, whether it was their first national competition, or indeed, their first ever competition. Thanks need to go to the individuals for participating, spectators for providing support and transport, club officials and most of all, Paul, for the huge time and effort put in behind the scenes, making it possible for everything to run smoothly. This weekend nineteen karateka from Selby boosted the IJKA Yorkshire contingent travelling to Nottingham for the competition to thirty-seven. Many thanks to our hosts Campbell and Langley Sensei for organising the competition and extending the invitation to join them. We have never really been a competition orientated club but we are slowly trying to build into our training some preparation and build up a small team. It was very encouraging to see so many of our club members come and compete for the first time. Although I am always a little disappointed at my performance I do find these events very motivational in my overall training. It spurs me on to make further improvements. Josh, Ellie, Abby, Amy, Lewis, Liam and Shauna were first on in the under 9 kata. Poor Shauna was I think the very first on. It is not easy when you are not even sure what should be happening. This happened to Rebecca at the European championships, it is very daunting. Don't worry about freezing, I do it all the time. Just look forward to the club competition in May. Abby did particularly well as a yellow belt knocking out a 2nd kyu, she was very unlucky not to be in the medals, may be next time? Leila and Jammie competed in the 10 to 15 years section, which was always going to be tough. You both performed your kata as well as you could with no mistakes. Well done, you both have quite a few years left in this age band so better luck next year. 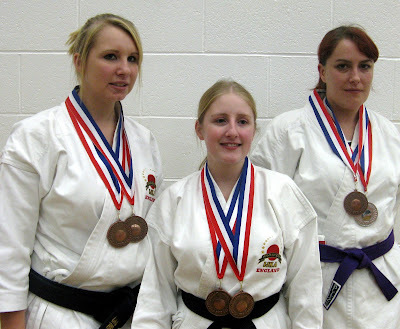 Claire, Alan and Julie all competed in the 16+ age group for 10th to 4th Kyu. I think as adults sometimes we put too much pressure on ourselves. As normal with a couple of minutes to go I was trying to run through kata in my head and couldn't remember anything, I started to panic (as usual) and thought just forget everything, relax and go out with an empty mind. It actually worked. You have all done your first event now, it will be easier every time from now on (promise). Rebecca was not competing so it left only Helen to fly the SSKC flag. I think her opening round was a split decision unfortunately going to the other karateka. 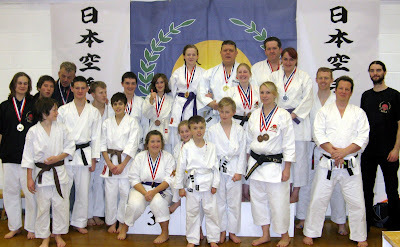 Dom, Mickey and myself were in a massive group of over thirty competing in 3rd kyu and above over 16 years. Poor Mikey was drawn against a really strong Japanese karateka. It seems that every event Mikey enters he has a really tough draw. I was just glad to finish my kata without a mistake, I usually get knocked out and then wait for the kumite. The standard of kumite was really strong and unfortunately Shobu Ippon Kumite is not something that we practice very much of at all with our low grade youngsters. We tend to have a strong focus on Gohon kumite up to 4th Kyu and then Jiyu-Ippon Kumite from 3rd Kyu to 1st Kyu. I personally see this as a strong foundation to long term development, but it may be a short term disadvantage for competition preparation. Claire, Alan, Julie as adults starting karate later in life I think kumite is difficult. We are not as flexible and we were as a youngsters and have been told for the last few decades not to go round punching and kicking people. Now our Sensei is shouting instructions from the sidelines , we can't hear them properly and having trouble breathing with this gum shield in our mouths. We keep think we are delivering scoring techniques, but no flags go up and the referee appears to be suddenly mute. The time keepers clock also seems to have stopped because we are starved of oxygen and there is not even a sign of the 30 second warning. When it does eventually come to the end of the round it is a draw and this bloke wants us to carry on for another minute when all we want to do is collapse in the corner out the way...welcome to Kumite, it does get better. Our big surprise of the day was Julie who gained a bronze medal for 3rd place in the Female kumite 10th to 4th kyu age 18+ years, not bad for a 7th Kyu, Gold next year? Mikey competed in the 3rd kyu and above kumite a very tough section and was unlucky not to progress further. Andy, Mike and myself competed in the "old mans" kumite which unfortunately was all a bit of a mix up, from entrants to the odd decision. All in All, the JKS (GB) Open gave our club the opportunity to compete at a level in between our club competition and the IJKA Europeans. Hopefully we can all look forward to May when we will hold our club competition and I think it will be July in Tallin, Estonia for the Europeans but this is yet to be confirmed. I would like to thank every one of the IJKA karateka for representing our three clubs, your discipline and conduct were a credit to our association. Otagai-ni-rei. Many thanks to Gullen Shihan our coach, Sensei Mike,Ian and Bernard for acting as our representative officials, without whom none of us can compete. Sensei-ni-rei. In the video above filmed in New Jersey, America earlier this month Sensei talks about the difference between similar moves in the Kanku kata. I was asked if I would write down Fushu and send it to a fellow karateka. I thought I might as well post it for all IJKA karateka instead. Please note this is the IJKA Kato Ryu kata "Fushu" aka "Kaze No Te" aka "Wind Hands". 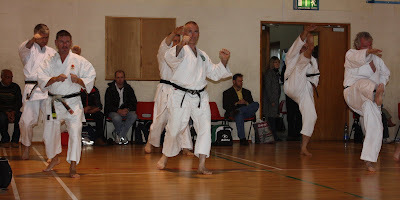 I have unfortunately only attended one session where Kato Shihan has taught this kata (Tuam Ireland October 2009). There is far more to the kata than a few words can describe. Unfortunately I can not remember the Kia points and I would welcome any corrections to the format. Hopefully I have manged to write down the majority of it as taught by Sensei. It may be a useful "memory jog" to those like me that have been shown once and have experienced that "frozen kata"feeling. I am limited on how I can display the file on my blog so I have uploaded to "Scribd" , hopefully you can open to view or print if you so wish. Weekend 28th-29th November 2009 - JKS Christmas Course, The John Godber Centre, Nottingham. Saturday 13.30 to 16.45 hrs, Sunday 12.15 to 15.30 hrs. With Campbell and Langley Sensei, Chief Instructors of the JKS in GB and Ireland. If you would like to attend please let Paul know ASAP. Weekend 4th-6th December 2009 – IJKA Christmas Course Hombu dojo Whitchurch. 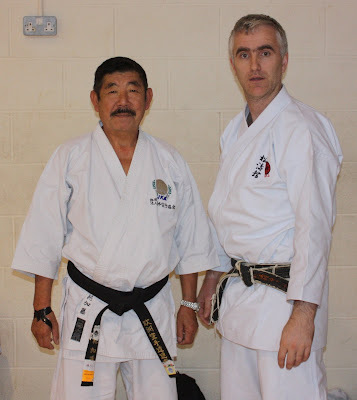 With Kato Shihan -9th Dan IJKA World Chief Instructor and Sensei of the Hombu dojo. If you want to attend and support our three members that are expected to take Dan gradings let Paul know ASAP. The course is not just restricted to Black and Brown belts, all grades are welcome. 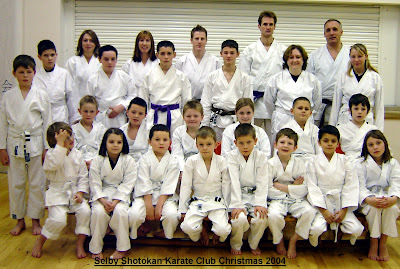 Sunday 6th December 2009 - A free months training for all SSKC Karateka, if you pay your IJKA membership fee by 13th December. This year I am putting back SSKC subscription renewals to January 2010 to help you spread your costs. You must hand in your IJKA licence (white licence) to Paul with your payment. Christmas Display – 5.30 to 7pm Only – Families encouraged to attend. Presentation of the Trevor Jinks Cup for 2009. We will also be taking the annual Christmas photo, please bring along any medals / cups you have won this year. 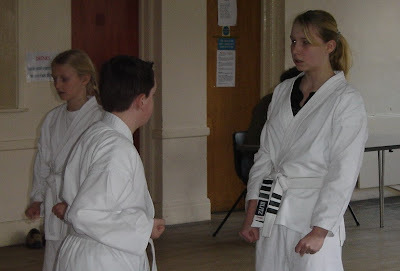 Sunday 3rd January 2010 – First training night @ Barlby High School. Normal monthly training fees due and SSKC membership renewal of £12 this will pay for your AMA renewal and personal insurance. You must hand in you AMA licence (Black Licence) to Paul with your payment. Every SSKC member MUST have individual insurance under the AMA to allow them to continue training. The “Runners and Riders” are sorted and I have returned our list of entries to Campbell Sensei – JKS (GB) for 2009. What a great turn out, thirty-eight karateka from IJKA Yorkshire will be travelling to the competition this year, with a total of Seventy-four entries to twenty-one of the thirty events run. I am particularly proud that we have eight entrants to the 9 years and below kata event, three entrants to the 8 years and below kumite event and 12 entrants to the 9-11 years kumite event. 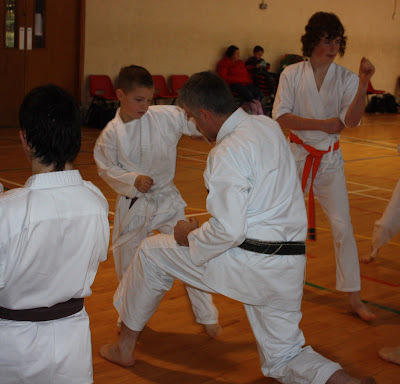 It is great to see our karateka getting involved in competition at an early stage of their training. It is also encouraging to see our adult low and mid grades stepping up to the mark and representing IJKA Yorkshire. Hopefully the majority of the competitors can stay and support the squad for the whole day so that we can get a team photo at the end. Maybe we can win a couple of medals along the way, with such a good turn out there will always be someone to watch / support. Many thanks to sensei Ian Shaw from Haxby and Bernard Schilke from Selby who have kindly offered to act as IJKA officials for the day. Without their support we would not be able to enter. Look forward to a great day and good luck, Osu! 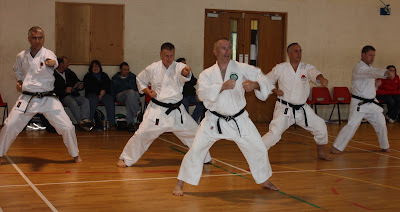 Many thanks to Sensei Jarlath Cunningham 5th Dan from Co Mayo in Ireland for sending me a disc with some photos from the course at Tuam, here are just a few that I have uploaded. Above: Kiba-dachi seemed to be the stance for the whole weekend! I have added a link to Sergej Vlasov Sensei blog to the links page under the "blog" section. Vlasav Sensei is Russian and resident in Norway, he has uploaded quite a few videos of Kato Shihan on You Tube under the name of Svlasov55. Many thanks Sensei for your contribution of IJKA video footage, looking forward to meeting you at Whitchurch in December. Click on the yellow buttons below to return to the "HOME" or "The Karate Way" blog. 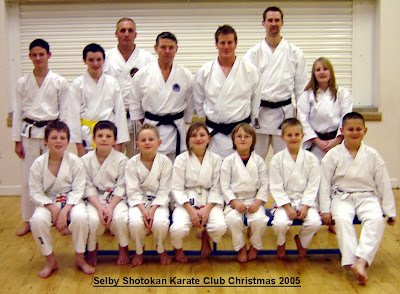 Many thanks to Gullen Shihan for travelling to Selby tonight to grade five Selby students that were not able to attend Kato Shihan's course in October. David Leadbeater - 8th Kyu "A very strong 8th Kyu pass"
All your individual member pages have been updated / created so you can follow your progress. To view your pages just click on the member button in the sidebar and click on your name. Many thanks to the Sensei from Latvia for posting more Asai Ryu kata on You tube. I have added their videos of Joko Issei and Kashu into the relevant kata pages. Click on the yellow buttons below to return to the "HOME" or "Kata" pages to view "Kashu" or "Joko Issei" katas. SSKC Track Suits are ordered. SSKC Tracksuits are now ordered and expected for delivery just before the JKS open. Unfortunately if you didn't get your order in, it is now too late. Many thanks to our recent sponsors "Mytum and Selby" (the skip people) and Howdens (timber and builders merchants) that has allowed us to subsidise the cost of tracksuits to members by approx £20/head. There may be an opportunity to purchase tracksuits next year if there is enough interest to put together a bulk order. Above : 2nd place "Our Maja!" 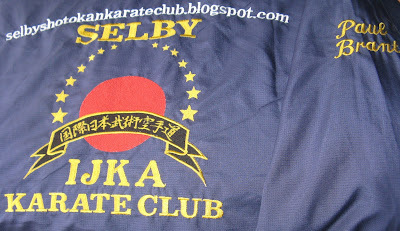 Over a quick pint after training at York last night Sensei Keith relayed to me the success of his recent student Maja. 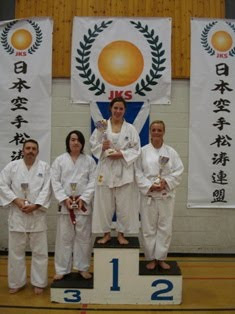 Maja from York dojo has just moved up North and is training in Edinburgh. She recently competed in the JKS Scottish nationals. Event 16 Mixed Kumite 16+ white to Yellow belt. Maja put a call into Sensei Keith to let him know about her success.